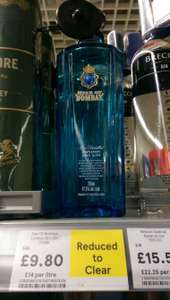 If it isn't Bombay, then what is it? Yip, just realised that! Paid 29p per unit! Rip off price I paid for the beers I also bought wipes out my saving on the gin though! Still £35 in Southend Essex store but on the bottom shelf so I wonder if it will be discounted sometime soon?